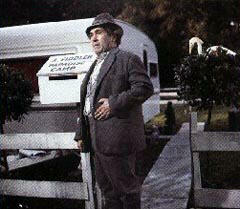 Peter Butterworth came to the Carry Ons as Doc in Cowboy in 1965. With his sensitive mobile face and jittery manner, he soon became a mainstay in the series. He had never performed in public before and was absolutely terrified, but he sung a duet with Rothwell called The Letter Edged In Black, followed by some comic repartee which, according to his own account, provoked enough boos and hisses to have the desired effect of drowning out the escape party. Something that made him become determined to enter show business was a treasured photograph of the concert party line-up. Tolly (Talbot Rothwell) gave him every help and encouragement and after the war, during a summer show at Scarborough, introduced him to the impressionist Janet Brown, whom he later married. 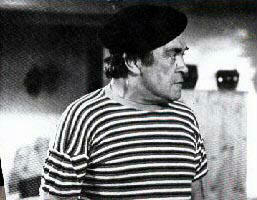 His face was well-known on TV in children’s programmes and in his shows with Ted Ray, Hugh Lloyd and Frankie Howerd. He has also appeared on stage in farces, revues and pantomimes and amongst his better films are The Prince And The Pauper and A Funny Thing Happened On The Way To The Forum. With the Carry Ons, we saw some of his better character acting and he rarely played bombastic or loud people, his characters tended towards the quiet and subtly potty. He was often cast as somebody else’s stooge. In Screaming, as Detective Constable Slowbotham, he is the fall guy for his incompetent thick headed superior, Detective Sergeant Bung (Harry H Corbett) or as Citizen Bidet in Don’t Lose Your Head, he has to stand by in helpless exasperation as his senior secret service officer, Citizen Camembert (Kenneth Williams) bungles all their chances. Peter’s particular form of laid back eccentricity comes into its own in Camping as Joshua Fiddler, the shifty campsite manager, who cons Sid James out of most of his cash. In Behind, in a role that is virtually the same as Camping’s, the scruffy, apparently furtive handyman, has a touching quality when Daphne (Joan Sims) claims him as her long lost husband. He is only on the screen for three minutes in Again Doctor but he has possibly the funniest scene in any of the Carry Ons, as you will see from the quote at the top of this page. Another good Carry On performance is his uncharacteristically flamboyant role in Abroad. As Pepe the manager of an unfinished hotel, who greets his unexpected guests in the guise of the builder, the porter, the receptionist and telephone operator he spends the first half of the film furiously trying to placate and accommodate them and the last half desperately trying to save the building from a flood, and whilst all this is going on, put up with his nagging wife (Hattie Jacques). He died on 16th January 1979 just before his 60th birthday when he was due on the stage in Coventry to appear in a pantomime. "A thoroughly nice bloke and a dear friend", said Peter Rogers.